Brazilian Foreign Policy under President Bolsonaro: What Should We Expect? The victory of Jair Bolsonaro in the presidential election in Brazil will have important implications for the country’s foreign policy. The elected president’s statements indicate the commitment to a policy more focused on partners such as the United States, Italy and Israel, and especially the commitment to reverse the practices adopted during the foreign policy of the governments Lula and Dilma (2003-16), which were truly engaged in the South-South cooperation logic and based on the ideas of universalism and autonomy. For the new president-elect, the country must abandon the ideological bias that has supposedly prevailed since the last decade. After a few years of immobility and diplomatic inertia (Dilma and Temer governments), Brazil is seemingly seeking a greater international presence with Bolsonaro, probably reviewing many of the guidelines that prevailed in the 2000s. Charles Hermann (1990) shows that the rise of a new leader and changes in the bureaucratic structure can have important effects on a country’s foreign policy, although the degree of change can range from mere adjustment or program changes to goal changes or even international orientation changes. At first, a greater convergence with the United States may be expected, a country with which Brazil had close relations during the Lula-Bush Jr. period, but which have undergone relative cooling since 2013 during Dilma’s government. The alleged admiration of Bolsonaro for the policies implemented by Trump may result in a strategy of increasing rapprochement, reinforced by the sharing of common ideas, especially in the criticisms of immigration, UN multilateralism, and Maduro’s Venezuela. It remains to be seen to what extent the United States will have an interest in strengthening cooperation with Brazil, especially considering the lack of interest of the North American leader in Latin America, evidenced in his absence at the 8th Summit of the Americas held in Lima in 2018. For the time being, it is quite clear that the American right wing likes Bolsonaro. Even Steve Bannon, Trump’s former adviser, endorsed him and stated: “He’s a figure like Trump“, understanding that Bolsonaro can contribute to a global populist tide. A big challenge for Brazilian foreign policy will come from the relationship with China. The country, which since 2009 occupies the position of largest Brazilian trading partner, sees Bolsonaro with great distrust. Bolsonaro’s trip to Taiwan in February 2018, as a presidential candidate, drew ire of China, which denounced it as an “affront to the sovereignty and territorial integrity of China”. Moreover, the president-elect has often characterized China as a predator for different sectors of the Brazilian economy, which resembles the rhetoric the president of the United States. The Chinese ignorance of Bolsonaro’s real intentions fuels resistance to the president-elect and reinforces rumors of a thorough review of bilateral ties. Endangering Chinese investments and financing in Brazil or threatening huge trade with the Asian partner are steps Brazil should not take. So, it is quite important to stop emulating Trump’s speeches and, above all, to stop flirting with Taiwan. With regard to the relations with European countries and with the European Union itself, the expectation is that there will be accommodation, surpassing the initial moment of surprise and criticism of the president-elect, especially for his misogyny, homophobic, and racist rhetoric, largely contrary to European commitments to human rights. Matteo Salvini, leader of the Italian extreme right and Minister of the Interior in his country was one the few Bolsonaro supporters from the old continent. On the trade front, the new government is expected to remain committed to advancing trade negotiations with the European Union, something that converges with the priority that is supposed to be given to bilateral (rather than multilateral) understandings, although there are uncertainties about the role of Mercosur as a bloc during the upcoming negotiations. A much more complicated scenario may be seen in the Middle East, where the president-elect’s decision to transfer the Tel Aviv embassy to Jerusalem will have serious consequences for Brazil’s position in the region and will run counter to decades of equidistant stance in the Israeli-Palestinian conflict. It is worth remembering that, even under the military regime, during the Geisel government (1974-1979), Brazil began to approach the Palestinian movement, having authorized the opening of a PLO (Palestine Liberation Organization) office in Brasilia. The controversial decision tends to isolate Brazil from important interlocutors in the region, such as Iran and several Arab countries, with possible effects on foreign trade, given that the region affirms itself as an important market, especially for chicken meat exports. Political isolation and a loss of legitimacy will be even more serious, with the country excluded from any role in the mediation of tensions in the region, something that has been actively pursued over the past decade. In making the decision about its embassy, Brazil will join a group that brings together Guatemala, the United States and countries traditionally aligned and subordinated to the dictates of Washington, such as the Marshall Islands, Micronesia, Nauru, and Palau. It is at the sub-regional level, however, that the greatest challenges appear. Brazil’s position in South America traditionally reflects a spirit of dialogue and conciliation, avoiding actions and initiatives lacking a multilateral basis. The president-elect’s government program suggests that Brazil will continue to engage in the region, but only with Latin American neighbors free of dictatorships, which certainly points to a move away from Venezuela. This already began with the end of the Dilma government, but is aggravated by the adoption of a more critical and hard discourse and the consideration of even stronger measures: the idea of a “peace mission” in the neighboring country was considered by the vice president-elect Hamilton Mourão during the elections. Following the electoral victory, there were declarations indicating a new priority to be given to Chile, where Bolsonaro will probably make his first trip as president, and a reduction of the traditional emphasis on the relations with Argentina and Mercosur. According to what was declared by the economy minister nominated for the new government, Paulo Guedes, Brazil should seek commercial relations with the whole world, without limiting itself to the regional environment. In addition, Mercosur is seen as a constraint on Brazilian commercial potential, notably because of the Common External Tariff (CET) and the obligation to negotiate jointly with external partners. 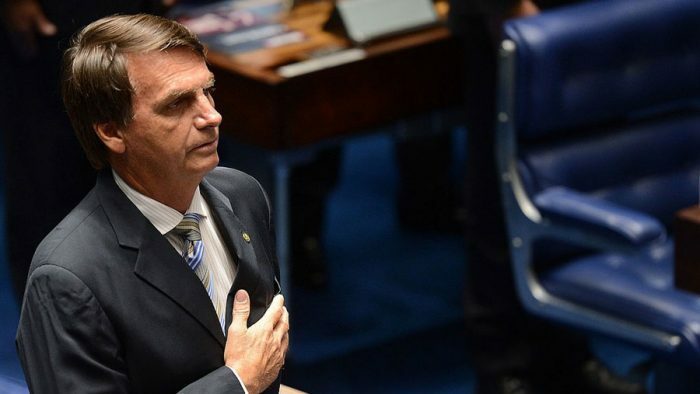 It would not be surprising, therefore, to witness the Bolsonaro government acting in favor of a tariff easing in the bloc, supposedly giving the country greater power to negotiate bilateral trade agreements. It is also worth noting that Bolsonaro’s victory in Brazil is a cause of concern in the region, where there has been a clear shift to the right and the end of an era of progressive governments in recent years, but where there has not yet been a threat from the far right, Brazil becoming the first country to see it come to power. It is understood that the Brazilian case can serve as a stimulus for similar movements in the neighborhood, something so far inconceivable in countries like Argentina. With regard to the commercial dimension of foreign policy, the president-elect and senior advisers indicate a preference for bilateral agreements, ruling out the priority traditionally given to negotiations in the multilateral trading system. Something similar had already been suggested at the beginning of the Temer government in 2016, without concrete achievements. The ultraliberal orientation of Guedes will certainly face strong resistance from industrial sectors that are not inclined towards an indiscriminate opening of the economy and are absolutely opposed to unilateral trade concessions. The president-elect himself has a history as a congressman that hardly corroborates the ultraliberal ideas of the minister indicated, approaching much more those of a nationalist orientation. There are, therefore, serious doubts about the effective course of Brazil’s trade diplomacy. Another variable that brings important uncertainties to the country’s international engagement is the criticism made in recent months by Bolsonaro, while still a candidate, to the United Nations and to multilateralism in general. The president-elect announced during the campaign that he would withdraw Brazil from the UN Human Rights Council and also threatened to leave the Paris Agreement, an idea that he later abandoned. In any case, the contempt for multilateral institutions where Brazil has a strong presence and performance seems striking in Bolsonaro’s speech and can bring serious constraints on Brazilian diplomacy, a traditional defender of multilateralism and international organizations. As Gelson Fonseca Jr (1998) teaches, Brazil, as a country that does not have surplus power, needs to ensure the legitimacy of its claims and the coherence of its actions, something that is naturally sought and achieved through the multilateral path. Once again, emulating Trump’s stances in this matter tends to have dire consequences for Brazilian diplomacy, a country which is – unlike the United States – not used to isolationism. Yet, under the claim that it was “no longer to praise murderous dictatorships and despise or even attack important democracies like USA, Israel, and Italy,” as contained in Bolsonaro’s government program, Brasilia would probably distance itself not only from Venezuela and some Arab countries and Iran, but also from African and Asian states, putting at stake the traditional universalism of Brazilian diplomacy, which points to the Brazilian willingness to engage in dialogue and cooperate even with countries that reflect little or nothing of its political, economic, or cultural profile. Hence, to reduce the supposed ideological bias of Brazilian foreign policy will mean closer and even subordinating ties with northern countries and fewer relations with the developing world. Even for the most part of the military regime (1964-1985), universalism and autonomy have remained as cornerstones of Brazilian diplomacy strategies. It is also important to recognize that the groups that traditionally occupy the main spaces in decision-making in foreign policy within the Ministry of Foreign Affairs, autonomists and pragmatic institutionalists (Pinheiro, 2000), may not be very well represented in the Bolsonaro government. In fact, on the one hand, the autonomists favor autonomy, universalism, and an increase of the Brazilian presence in international affairs, approaching the development perspective in economic subjects, while seeking the association with other emerging countries with characteristics similar to Brazil in the political-strategic sphere (Saraiva, 2010). This barely converges with the foreign policy preferences revealed by the president-elect. On the other hand, pragmatic institutionalists defend a process of “conditional liberalization” (Saraiva, 2010), something that has little to do with Guedes’ ultraliberal ideas, and prioritize Brazil’s support for international regimes with great activism in international forums, something that also goes against Bolsonaro’s harsh criticism of UN agendas and multilateralism. It is hoped, however, that the institutional strength of the Ministry of Foreign Affairs and Brazilian professional diplomacy will help to contain any irrationalities and voluntarist impulses that could undermine the historical principles of Brazilian international action. This might be the case regardless of the foreign policy paradigm that will prevail and the changes that may be implemented, profound as they may be for Brazil’s goals and international orientation (Hermann, 1990), upending these to a degree that has not been seen in the passage from the Fernando Henrique Cardoso government (1995-2002) to the Lula era (2003-2010). There is still great doubt about the degree of commitment of the new government to the perception of foreign policy as a public policy. In fact, the progressive opening and politicization of foreign policy, which has been initiated mainly after re-democratization, is still in the process of being consolidated and depends on a greater dialogue with the press, parliament, and civil society. Hence, considering certain stances of the president-elect against the press and segments of civil society, who may increasingly be marginalized from discussions on international issues, some setbacks with regard to public diplomacy may be faced in the near future. The resumption of a more conservative perspective on foreign policy as a simple state policy, away from society, will result in a much less representative role played by the country, especially in subjects such as human rights and environment. Recovering more activism in the international realm is a desirable and necessary goal, as well as rethinking the foreign policy strategy to be adopted, since it is no longer possible to maintain by outdated initiatives and approaches that are not well suited to the new domestic and international reality. However, it will be necessary to act responsibly and pragmatically, bearing in mind the real dimensions and capacities of the country, as well as a precise notion of the challenges and interests that exist. To emulate positions of much stronger partners or to be guided by narrow revisionism of the measures of previous governments can have dramatic and long-term consequences for the country. Fonseca Jr, Gelson. Alguns Aspectos da Política Externa Brasileira Contemporânea. In A Legitimidade e Outras Questões Internacionais: Poder e Ética entre as Nações. Paz e Terra, 1998, p.353-374. Hermann, Charles F. “Changing course: when governments choose to redirect foreign policy”. In International Studies Quarterly. Vol.34 n.1, 1990. p. 3-21. Pinheiro, L. “Traídos pelo desejo: um ensaio sobre a teoria e a prática da Política Externa Brasileira contemporânea”. In Contexto Internacional, Vol.22, n.2, Jul./Dez., p. 305-335, 2000. Saraiva, Miriam G. A diplomacia brasileira e a visão sobre a inserção externa do Brasil: institucionalistas pragmáticos X autonomistas. In Mural Internacional, Year 1 n.1. Rio de Janeiro, PPGRI/UERJ, Jan/Jun.2010. p.45-52. Paulo Afonso Velasco Júnior is currently Associate Professor of International Politics at the Rio de Janeiro State University (UERJ). He holds a PhD in Political Science from the Institute of Social and Political Studies of the Rio de Janeiro State University (IESP-UERJ) and a Masters from the Institute of International Relations of the Pontifical Catholic University of Rio de Janeiro (IRI-PUC-Rio). He is a senior fellow at the Brazilian Center for International Relations (CEBRI). His research focuses on Brazilian foreign policy and regionalism.